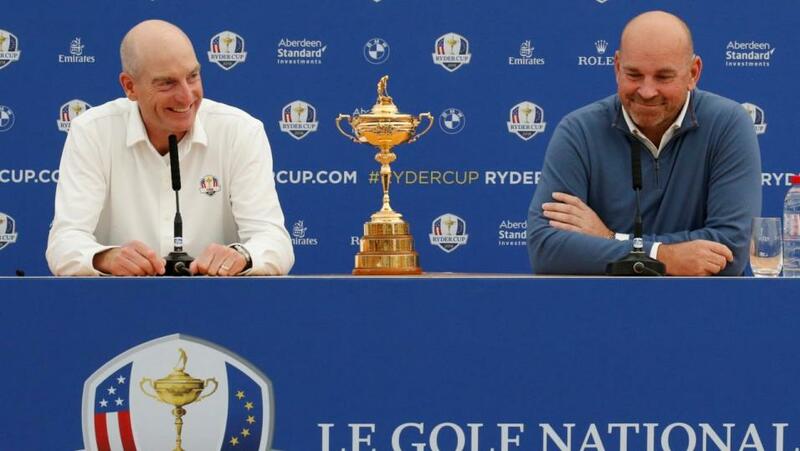 Captains Jim Furyk (l) and Thomas Bjorn: But who will be smiling on Sunday evening? "Nine members of this US team are major champions, with the other three yet to reach 30." Logic suggests that Europe should have a huge advantage heading into this week's Ryder Cup match in France. The course on which the 42nd Ryder Cup is to be staged has been a regular European Tour venue for more than 25 years - including the last 17 French Opens. Every member of the European side has competed at Le Golf National at least once, including seven of the 12 at this year's event in June. The most recent two winners of the tournament are part of Europe's 2018 team, while 11 of their dozen representatives have all posted at least one top-10 finish at the course at some point during their careers. The odd one out is Tyrrell Hatton whose best finish at Le Golf National is a tie-for-12th. Compare that to the United States team, of which only three have ever competed there before. Brooks Koepka, Justin Thomas and Bubba Watson have each played there once - with two of them missing the cut. Only Justin's tie-for-eighth, earlier this year, stands out for the visitors. However, the 28-year-old course should certainly not feel foreign to the American players. It is a modern stadium-style course, similar to many of the venues within the TPC network of clubs in the United States. Le Golf National has plenty of water - affecting 10 holes - as well as greens and fairways that are beautifully contoured and undulating, and there is a fair amount of sand too. All of these features are commonplace in most modern layouts in the United States, so the visitors should quickly feel at home on the outskirts of Paris. Just ask American Brendan Steele who seemed to enjoy his trips to Europe, just a handful of years ago. The 35-year-old, three-times PGA Tour winner from California, played the French Open on three occasions between 2011 and 2015, and never finished lower than seventh. The late Seve Ballesteros often referred to the Muirfield Generation, when describing the European team which brought to an end America's dominance of the Ryder Cup during the mid-1980s. After winning back the trophy at The Belfry in 1985 - following 28 years of despair - the European XII under non-playing skipper Tony Jacklin travelled to Ohio for the next match boasting a young, strong team. Their victory at Muirfield Village, in September 1987, was a milestone in Ryder Cup history, as the United States lost on home soil for the first time. Europe boasted of players such as Seve, Nick Faldo, Bernhard Langer, Sandy Lyle and Ian Woosnam, as well as a 21-year-old Jose Maria Olazabal. Four of these six were already Major winners, with the other two enjoying their moments in the sunlight a few years later. Between 1983 and 1994, these European players collected 14 major titles, including at least one success in 11 of those 12 seasons. And if you study the personnel representing this year's American team, there are certainly parallels regarding their European counterparts from three decades ago. Seven members of the US contingent have yet to reach 30, and that does not include Dustin Johnson who is back as world No 1 going into this week's clash. Jordan Spieth, Justin Thomas, Brooks Koepka, Patrick Reed and Rickie Fowler are likely to form the nucleus of many American sides over the next few years, and perhaps Bryson DeChambeau and Tony Finau will also become Ryder Cup regulars. Nine members of this team are major champions, with the other three yet to reach 30. In time, the 2018 vintage could be viewed as being even stronger than the famed-American teams of 1975 and 1981, and that would take some beating. Nicklaus, Trevino, Miller, Irwin and Floyd, were just five of the surnames which played in both of those matches, not to mention Watson who joined this group at Walton Heath in 1981. Since that match in the Surrey countryside 37 years ago, the Americans have only won once away from home. But maybe their exciting young 'Generation France' will herald in a new era of US glory in the Ryder Cup, as they attempt to secure back-to-back wins for the first time since 1993. 'Veteran' Tiger Woods will be full of confidence following his comeback win in Georgia on Sunday, so momentum appears to be with the Americans right now. And if Europe fails to start strongly on familiar home turf, the mainly youthful invaders from across the Atlantic may well secure a foothold in the match and take control of the famous old trophy.